Solids 2015, held on 30th September and 1st October, confirmed its value for the bulk industry. 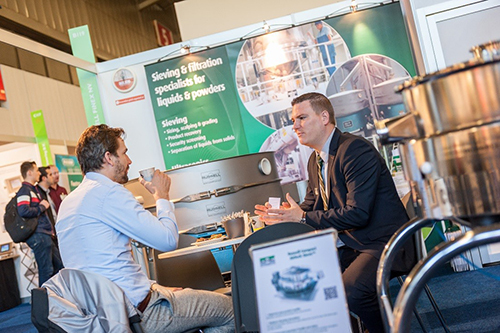 A large buzzing network platform, where discussions about solids processing, handling and transport took place. A presentation of a wide range new product developments and latest innovations in the field of dosing, weighing and measuring devices, machine and plant construction, sieving, separators, strainers, filters and handling. A pragmatic approach for bulk solids professionals sourcing explosion prevention, energy conservation, cost reduction, quality improvement, efficiency and contamination prevention. To highlight new products an ‘innovations tour’ was organized this year. Participants of this tour were given 10 minutes to present their latest innovation. Russell Finex were among the participants and presented their Russell Gated Outlet™, a device to control both oversize discharge and product flow. At their stand Russell Finex showcased other screening equipment including a multi-deck vibratory separator, a vibratory sieve with a bag emptying platform and a vibratory sifter with high product confinement. Read more Russell Finex’s machinery which were on display at Solids Rotterdam. Like Russell Finex most of the exhibitors at Solids Rotterdam have participated in the show for many years. Over the years the show has become a recognizable event within the bulk solids industry. Solids Rotterdam is part of the Solids European Series, and the next show in the series where Russell Finex will be present,is at Schüttgut in Dortmund, Germany. Contact Russell Finex if you have any queries or need more information about their screening equipment.